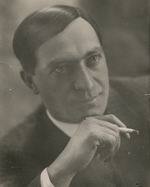 Set designer, one of the founders of Georgian avant-garde stage design, Art director, graphic artist-futurist, constructivist, in painting with obvious features of expressionism and art nouveau. He was born in 1894 in Gori, Georgia. In 1910 he studies at Tbilisi Sklifasovsky School of Drawing and Painting in B. Fogel’s and B. Shebuev’s classes. After graduating Tbilisi Theological Seminary he continues studying at the faculty of Medicine first at Rostov then at Tbilisi University. During some period he studies at Tbilisi Academy of Arts. In 1921 theatre director Kote Marjanishvili, after seeing his paintings “Malaria” and “Death Dance”, invites him to the theatre to design Oscar Wilde’s “Salomea”. Kiril Zdanevich wrote on this account in 1923: “This first justified attempt sets great roads to the young artist. This road is – the reformation of the decoration part of the Georgian stage. The further progress and work of the artist in this direction depends on the leaders of the Georgian stage. We wish them to say farewell to the outdated narrow ethnographic traditional decorations and transfer to the new creative work.” (‘Galaktion Tabidze Journal’, 5, Tiflis, 1923). And indeed Gamrekeli becomes the reformer of the Georgian stage design and this fact is promoted by his collaboration with two great stage-directors and reformers of the Georgian and Russian stages – Kote Marjanishvili and Sandro Akhmeteli. In 1923-1943 he first works as an artist at Marjanishvili theatre, and from 1926 – with Sandro Akhmeteli at Rustaveli theatre. He is one of the founders of the Georgian left-wing art of Soviet times; he is the designer of the futurist journal “H2SO4” (1924); designer of the journal “Leftism” and books by modernist poets, writers - Iona Vakeli, Grigol Robakidze, Simon Chikovani and others (1926, 1927). In 1928 together with the artist Sidamon-Eristavi he works on the expressionist film by Kote Mikaberidze “My Grandmother” which was later banned for the decades. However, the main field of his activities is the stage design. From 1920s his set design is futuristic while later he merges with leftist constructivism: G. Robakidze’s “Londa”(1922) and “Maelstrom” (1923-24), Ernst Toller’s “Man and the Masses” (1923), F. Werfel’s “Der Spiegelmensch”, William Shakespeare’s “Hamlet” (1925), A. Glebov’s “Zagmuk” (1926), N. Shiukashvili’s “American Uncle” (1926), B. Lavrenev’s “Break-up” (1928), S. Shanshiashvili’s “Anzori” (1928). In 1929 – W. Hasenclever’s “A Better Man” (Ein besserer Herr), 1930 – G. Robakidze’s “Lamara”, 1931 – Sh. Dadiani’s “Tetnuldi”, 1933 – F. Schiller’s “Robbers”, 1937 – “Othello”, 1940 – A. Korneichuk’s “Bogdan Khmelnitski”, 1942 – K. Goldoni’s “Bride from the Playbill”, etc. He also works at Tbilisi Griboyedov Russian Drama Theatre, Tbilisi Opera and Ballet House, Leningrad Gorky Drama Theatre, Odessa Opera and Ballet theatre. He collaborates with Tbilisi film-studio and is the art director of the films “Arsena” (1937) and “Giorgi Saakadze” (1942-1943). He died in Tbilisi in 1943.